Are you working asa journalist? You are eligible to apply for an international press pass from us. Become a member of the United States Press Agency and take advantage of the many benefits we offer. Our members are so satisfied with our work that 97.7 % of them renewed their press passes last year. That's something we are proud of. This vote of confidence inspires us to further expand the services we offer. Apply for your press pass online in a few easy steps. Fill out an application form and upload a passport photo of yourself. To complete your registration, simply click on the confirmation link you will receive via email. Your membership application will be reviewed and, when indicated, approved within 48 hours. You will then receive an email containing your activation link. Clicking on this link will automatically direct you to our website to make your payment. There is a one-time registration fee of $108.00. The annual membership fee is $48. The fee is prorated if you sign up during the year. (Example: If you register in July, we only charge for the months of July through December.) At the end of October, we ask you to renew your membership for the coming year. Click on the link Apply For Your Press Pass on the right. Complete and submit our application form. Click on the confirmation link in the email you will receive from us. We will then send you an email containing your activation link. We will send you a message within 48 hours. Clicking on this link will automatically direct you to our website to make your payment. Who is eligible for USPA membership? The United States Press Agency is open to all media professionals such as photographers, journalists, reporters, bloggers, editors, freelancers and correspondents. Click here for details on eligibility requirements and suitable proof of your journalistic activity. Journalistic activity shall mean the publication of written material, photographic images and sound, both in print and offline media, as well as on the radio, Internet and through other appropriate means of publication. This includes the following activities: press photography, research, public relations, selection and editing of media content. We also welcome journalism students and those who are just starting out on their career path. Why do I need a press pass? The job titles "press photographer" and "journalist" are not protected by law. If you work in this field, legitimate certification is key. It allows you to stand out from the crowd and distinguish yourself as a professional right from the start. 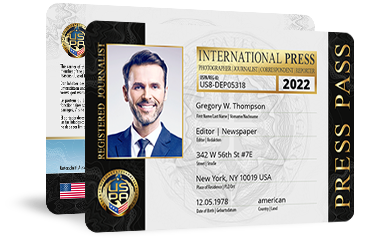 In addition to a press pass, a press ID/Reporter Card, letter of accreditation and a press vehicle ID, we also provide you with our seal to use at your discretion. Where can I use the press pass? A press pass is very helpful for visiting many events. Whether you want to cover a concert, trade show, sporting event, film or theater premiere: Many organizers only grant access to journalists who have previously applied for accreditation and can present a valid press pass. A press pass is proof that you are a legitimate journalist. It shows agencies, organizations and event hosts that its owner is conducting journalistic research. 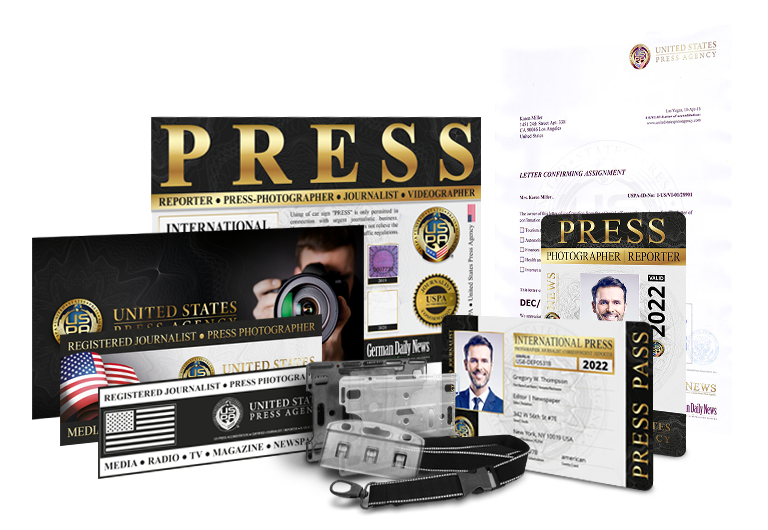 A press pass from the United States Press Agency (USPA) is recognized around the world. The United States Press Agency, USPA for short, is among the leading press agencies in the United States. USPA is open to all journalistic professionals such as photographers, journalists, reporters, bloggers, videographers, editors, freelancers, correspondents and photojournalists in the United States and Europe. USPA is an international, nonpartisan, independent association that is not affiliated with any political party, union, financial institution or publisher. Why should I apply for a press pass from USPA? If you have additional questions, please visit our webseite. Or send us an email using our contact form.